Country, County, Barony and Parish. Upon its completion in 1658 the Down Survey, along with the Strafford Survey from the 1630s, were housed in the Surveyor General’s Office in Dublin. According to William Petty, there were 2,278 parishes in Ireland. From this number, the number of parishes with no forfeitures must be deducted, as these were not surveyed or mapped. The number of maps was further reduced by the practise of drawing more than one parish on each sheet if it were practical to do so. By abstracting these unforfeited parishes from the Books of Survey and Distribution, and combining those smaller contiguous parishes that may reasonably have been combined on the Down Survey maps, the number of parish maps is 1,400. Out of these, 250 are Strafford maps leaving a potential total of 1,150 original Down Survey parish maps. 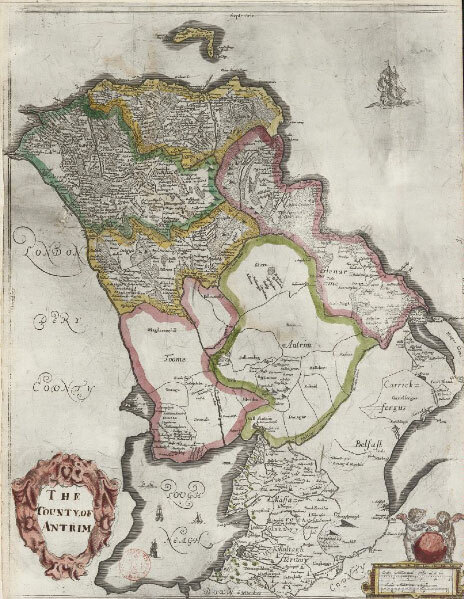 The maps and accompanying terriers (textual descriptions) were bound into volumes and available for public consultation until the destruction of a large amount of the material in an accidental fire in 1711. 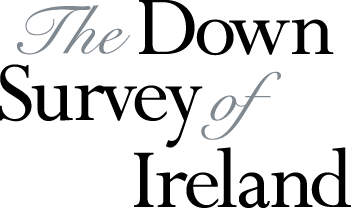 The Down Survey survived in its entirety for ten counties – Carlow, Donegal, Dublin, Leitrim, Londonderry, Tyrone, Waterford, Westmeath, Wexford and Wicklow – while the volumes for Clare, Galway, Kerry, and Roscommon (including the Strafford material) were completely destroyed. Only ‘a few burnt papers’ remained of Cavan, Fermanagh, Kildare, Louth, Monaghan, Mayo and Sligo but at least one complete volume and additional papers survived for each of Antrim, Armagh, Cork, Down, Dublin, Meath, Kilkenny, Laois, Limerick, Longford, Offaly and Tipperary. All the surviving original maps were finally destroyed in the Custom House Fire in 1922. 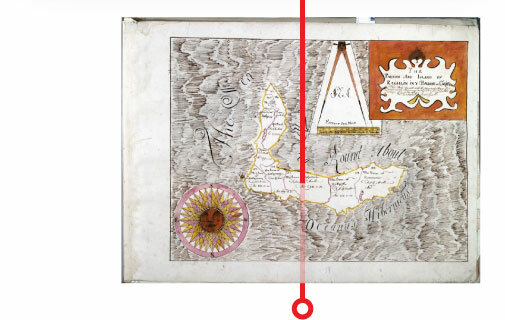 The maps used in this project and displayed on the website are either copies of parish maps made in manuscript from the originals, or similar maps made by Petty and his team at the same time as the Down Survey was being compiled. 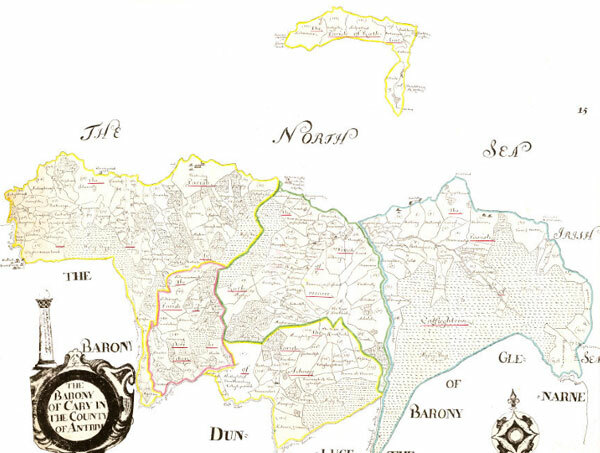 The seventh article of Petty’s contract committed him to create a set of barony maps and that these ‘perfect and exact mapps may be had for publique use of each of the barronyes and countyes aforesaid’. These maps, bound with the title Hibernia Regnum, were to be prepared in addition to the Down Survey maps and have had an eventful history. Hibernia Regnum was captured by French privateers in 1707 from the vessel Unity, while en route from Dublin to London. It came into the possession of Monsieur de Valincont, Secretary General of the Navy in 1709, and is next recorded in the possession of the Abbot Dubois, an advisor to the Duke of Orleans, in 1718. Dubois gave the volumes to Guillaume de l’Isle, by now Royal Cartographer to the French king and the foremost cartographer of his time. The manuscript was donated to the Imperial Library by de l’Isle’s widow in 1727, and remained there almost entirely undisturbed until 1774, when they were brought to the attention of the Earl of Harcourt, a British ambassador to Paris. In 1786, Sir William Petty, First Marquis of Lansdowne and Earl of Shelburne ( a relation of his namesake from the 1650s), asked for it back via John Frederick, Duke of Dorset, ambassador to Paris. The French King was quite willing to accede to the request but was blocked from doing so by the Library, which pointed out that it was unwise for the King to start returning stolen manuscripts as the Library held a large number of these. 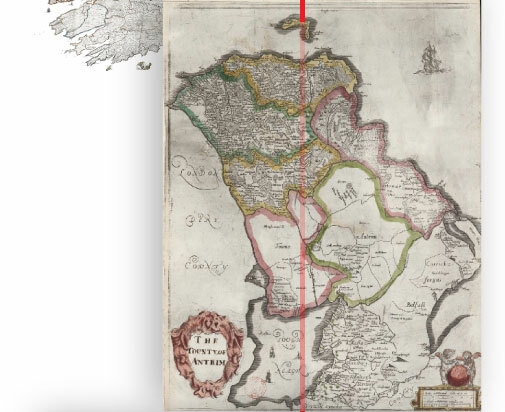 Hibernia Regnum was finally copied in 1789 by General Charles Vallancey, late of the army Corps of Engineers, one Major Taylor, who had produced a book of road maps of Ireland in 1777, a French engraver and a number of assistants. This almost exact copy was brought back to Dublin and was photographed and published by the Ordnance Survey in 1908. The barony maps displayed on this site are a hand coloured copy of this edition, with a small number of additional maps not present in this set. Numerous copies were made of those Down Survey maps surviving post 1711 and prior to the final destruction of the manuscripts in the Custom House fire of 1922. In 1786 Daniel O’Brien copied those maps bound in books that had survived the fire in reasonably good order. O’Brien was previously a clerk at Dublin Port and working under the instruction of Robert Rochford, Deputy Surveyor of Lands. Rochford followed the now established tradition among Down Survey protagonists of taking these copies into his private care from where they passed to his widow, his executor and eventually into the custody of Reeves and Company, the solicitors for Forfeited Estates and were not seen again until 1965. The collection was sold in two sections to the National Library of Ireland and the Public Record Office of Northern Ireland. These form the bulk of the parish maps and terriers used on the site. An important set of tracings from Down Survey maps is currently undergoing conservation at the National Archives of Ireland. 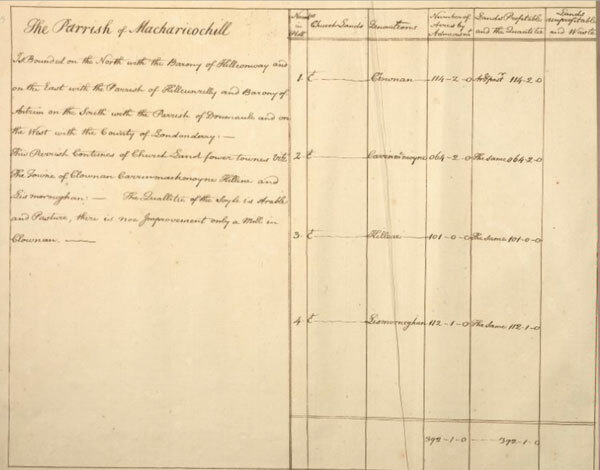 The tracings, some 2,700 in number, were made for the Griffiths’ Boundary Survey from 1824 onwards and were used by these surveyors to confirm the location of town land boundaries. This material was transferred to the Ordnance Survey office in the 1830s and was used to create the First Edition maps from 1838. The Ordnance Survey surveyors had the authority to accurately survey the boundaries, but not to change or delete them, thus creating the strong continuity between Petty’s surveyors and property boundaries as they exist in the present. These tracings are used on the site to fill in gaps in the Reeves set. 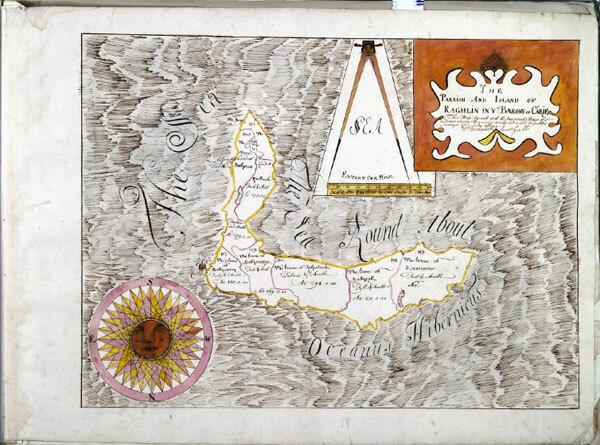 In addition we have displayed maps for the northern half of County Antrim by William Molesworth (1720) and a set for County Sligo now in Sligo County Library, as they are close in appearance to the originals. A terrier is a written description accompanying townland maps. The Down Survey included a terrier with each parish map and included a reference number for every townland on both map and terrier. This numbering system allowed the survey information to be transferred to other sources such as the Books of Survey and Distribution. Effectively, the Down Survey terriers have much the same structure as a modern GIS with the land owner data related to a specific geographical place, with the added advantage of this hierarchical data being linked to other sources. This was a remarkable achievement for the 17th-century. A unique feature of the Down Survey terriers is that they also include a detailed description of each parish. These range from the purely functional, a written description of its location and a list of townlands contained within it, to fuller descriptions that can include descriptions of buildings, commerce, inhabitants and local customs. In many cases the parish description gives an account of the effects of the Civil War on the parish concerned with lists of castles and other buildings that were still standing, and which were destroyed and the general state of the land. The surviving terriers, entirely drawn from the Reeves Collection in the National Library of Ireland and the Public Record Office of Northern Ireland, have been included as images on the site. Detailed descriptions of each barony were also compiled and included with the bound volumes of the Down Survey, again ranging from functional to remarkably descriptive. These are not in the strictest sense ‘terriers’, in that they do not contain lists of land owners, they have been included as they comprise an important part of the survey. The barony terriers focus on the remarkable features contained in each, landmarks, important rivers, places of commerce and local customs. 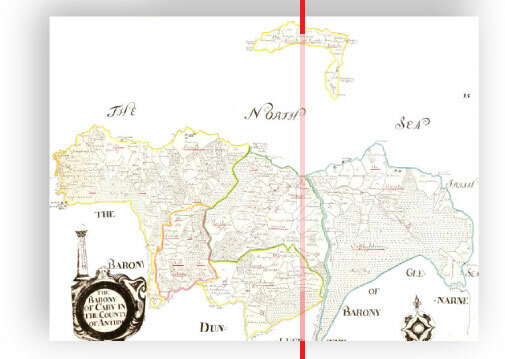 As a source of local history they are quite unique, are transcribed and can be viewed with the matching barony map. The barony terriers are not all from a single source. Most derive from the Reeves Collection, but where missing are from the Annesley version of the Books of Survey and Distribution. The one inch to one mile (1:63,360) edition of the Ordnance Survey of Ireland was published from the 1860s on 205 sheets. It was intended to be a more accessible set of maps than the six inch to one mile (1,500 sheets) or the original 25 inch to one mile (15,000 sheets) editions. 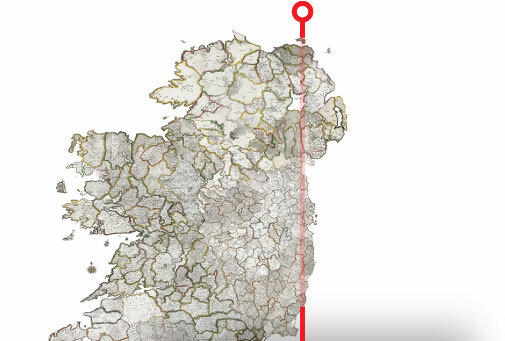 The 205 sheets have been digitised and joined together to form a seamless map of Ireland. The late 19th-Century maps were chosen to provide a bridge between the Down Survey and the modern topographical maps and satellite images derived from Google Maps and Google Earth.